On Day 2 I started the very basics of the text adventure. As of then my game was a canvas tag on a page. What I did is put a textarea and an input box below the canvas tag so that I could get some output while still having the game be intact. Now that we had a way to get words in, we needed a way to get actions out. Generally speaking text adventure game commands followed the format of [VERB] [ADJEECTIVE] [NOUN]. More or less, we want to [VERB] on the [NOUN] that is [ADJECTIVE]. For example, we could to GET [VERB] YE [ADJECTIVE] FLASK [NOUN]. In addition, we'd have to deal with extra words. Take PICK UP TRINKET vs. PICK TRINKET. PICK is the [VERB] and TRINKET is the [NOUN], but UP's only purpose is to make the sentence sound like something a human would say. How the heck do we do all that? Simple enough, right? Here's the screwball. What do we do with the verb? How do we associate the verb with code? The problem with THAT is that you can only get the value of an object's key if you know its name. So, for instance, to get key1 you'd type ObjectName.key1. What you could not do, however, is say 'var key = "key1"; var ObjectName = ...; ObjectName.key' and expect to get key1's value. Here's where we get a bit fun and hackish. Let's look at arrays. You don't know the name of anything in an array. Therefore, you can't say 'Array.element' and expect to get anything. What you do instead is tell an array to get the value at index 'element' like so: 'Array[element]'. For arrays, 'element' is a number. But for objects, 'element' is a string, corresponding with the key's name. Therefore, while you can't say 'ObjectName.key' and get key1's value, you CAN say 'ObjectName[key]', because the  expects a string (in quotes), and not a name, so it gets the value of key, which is a string, and uses that. It's funky as funk, but it works beautifully. Here's what that command object ends up looking like. //Call the command "GET" with the words "YE FLASK". monstersCaught: 0,  //Holdover from old code. Monsters killed/ice cream cones eaten. maxFrames: 1, animSpeed: 1, animFrame: 1, image: null, //Animation stuff. Will cover later. Sticking with the "GO TO SOUTH" example, we need to find the South exit and go to it. How do we do that? It's not too hard. We have an array of words, "tokenList". (A token is an individual word or element that is distinct from the rest.) 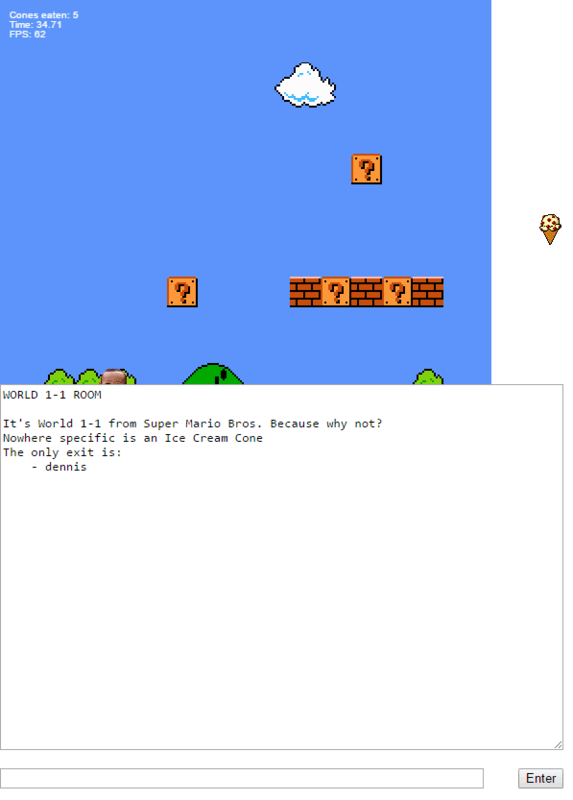 We also, for each level, have an array of exits, "rooms[hero.currentRoom].exits". name: "south" // Name of exit for text adv. (More tangents. "Watson" is the name I gave to the text adventure hero. I made a whole plot and everything, although I'll admit it's not particularly good. It really needed more time to sort itself out. But I'll get to that later.) The actual code converts both names to lowercase too, but that's the jist of it. To put all THAT into perspective, let's go to the original input. The first word is "GO", so we call the "GO" function with all the other words as the argument. Then it looks through every word. "TO" is not an exit, so it gets skipped. However, "SOUTH" is. So the code ends up setting your current room to the room "SOUTH" corresponds to. ...I guess that wasn't shorter at all. Which is strange, because all that only took an hour. (Although to be fair a lot of this spilled over into the next day.) But hey, next time we get to deal with adjectives and multiple nouns. Oh boy. © 2016 InvisibleUp. Hosted by NeoCities!